This blog has been dormant for a while and the publication of Digital Media and Reporting Conflict: Blogging and the BBC's Coverage of War and Terrorism is the right time to formally close it. It's been an amazing journey over the last five years or so and I've really enjoyed working on the project, working with people at the BBC and meeting people throughout the media industry. I'd like to thank all the people who made this book possible - my family, my friends, my PhD supervisor at King's College London, everybody at the BBC who gave up their time to participate, the Frontline Club and the countless people I interacted with online. When I decide to do something I put everything into it. I hope the book testifies to the high standards and hard work that I tried to bring to it. But perhaps more than that I hope the book and the hundreds of blog posts I wrote continue to be a useful resource for students of warfare, media, journalism and the BBC. I took most pleasure from knowing that other people found my work useful and that it contributed in a small way to public understanding of the changing nature of reporting war and terrorism. Achievements come at a cost and over the last couple of years in particular I invested a lot of myself, my time, my financial and physical resources into seeing the book through. I also spent a lot of time banging at academic doors that I found were closed to me or only open if I was willing to work for free which I sustained for far longer than I should have done. In hindsight, all this effort was too much and I really burnt myself - not giving up is a great strength and a terrible weakness. I think it's a sacrifice I am only willing to make again in a different context. A wise man once said that you have to give up your life in order to save it. And it's time to leave a road which had become intolerably tough and start something new. I'm not entirely sure what that looks like yet but I have long been involved in Christian ministry and I'm pretty sure it involves achieving a lot less and loving other people a lot more. In the meantime, I need to rest, heal and rebuild my strength. For those of you who want to remain in touch my current email address is mail-AT-dsbennett.co.uk. In 2009, I wrote a blog post arguing that the Israel Defense Forces (IDF) had "fallen off the social media bandwagon". Their digital media campaign in support of Operation Cast Lead in Gaza was hastily conceived, unimaginative and anti-social. New tools were used to disseminate traditional military messages with little regard for a new online culture of communication. Nearly four years later, the IDF's social media strategy is much more sophisticated, offering online audiences regular and engaging updates on the progress of Operation Pillar of Defense. As I noted at the time, this bland 'press statement' delivered by Capt. Benjamin Rutland takes place in a washed out 'non-place' with the Israeli flag propped up against the wall. Not exactly engaging content. Back in 2009, Twitter was mainly used as a way of linking to exceptionally dry updates on the IDF Spokesperson blog which were often written in impenetrable military jargon. On both the blog and the Twitter feed there was little evidence of the IDF trying to influence, drive and engage in the conversation around the conflict. Now the IDF Twitter feed is being written in plain English. What's more, the IDF is also using hashtags (#IsraelUnderFire), encouraging Twitter users to retweet their content and creating imagery that the IDF believe will be circulated by online communities. It is also posting all manner of facts and figures and commenting on the issues which might affect the outcome of the battle for public opinion. In 2009, Noah Shachtman revealed in Wired just how ad hoc the planning for the social media element of the information war had been during Operation Cast Lead, describing the IDF's YouTube campaign as "off-the-cuff" - a last-minute idea by a group of "twenty-something" soldiers. Shortly after Operation Cast Lead, the IDF's Twitter fell silent for 179 days and only began updating again in August 2009. In December, Haaretz reported that a new media unit would be set up to engage online audiences on Facebook, YouTube and Twitter. In the three years since then, the IDF has clearly revisited its approach to social media. According to Reuters the Israeli foreign ministry invested $15 million dollars in social media in 2010 and although the IDF was still learning it was notable that their YouTube channel was beginning to attract the attention of news journalists by the time of the Gaza flotilla raid in May 2010. A 'behind-the-scenes' TV report demonstrated how the online presence of IDF Spokesperson was updated by a fully operational "New Media desk" by 2011. 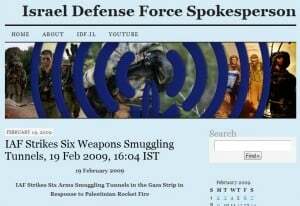 The 2012 online media campaign for Operation Pillar of Defense is undoubtedly a significant 'improvement' in Israel's attempt to communicate their version of the conflict using social media tools. But challenges remain. In particular, the use of Twitter more explicitly blurs an already blurred boundary between psychological operations and public information campaigns. In the last few days, the IDF has addressed all manner of online audiences with its Twitter feed. Some updates are probably designed to be picked up by journalists - announcing the onset of the airstrikes via Twitter rather than in a news conference was an interesting departure, but hardly surprising given the widespread adoption of Twitter by journalists at media organisations. The IDF's Twitter feed is also trying to leverage an active online community which is supportive of Israel's goals by producing content which can be disseminated online through retweets on Twitter and sharing on social networks. Other content, such as the YouTube explainers, can be seen as an attempt to convince sceptics of Israel's military operation. These activities might all fall into the remit of public information campaigns, but at the same time the account is being used for purposes which could be viewed as a function of psychological operations. One IDF tweet issued a warning to Hamas operatives and as Stuart Hughes pointed out on the BBC's College of Journalism blog the IDF's Twitter account has also attracted the attention of Hamas' military wing, the Al-Qassam Brigades. Communicating messages successfully to different audiences in the same space is problematic, particularly when the 'audience' can write back. Critics have argued that the IDF's Twitter feed is a distasteful addition to an immoral military campaign. The Now Lebanon blog, for example, headlined a post with the title: 'IDF cheerily live-tweets infanticide'. And the unanswered question is this: what difference, if any, will the IDF's social media campaign make? A template for the future? Nevertheless, the IDF's social media campaign in support of Operation Pillar of Defense might prove to be a template for future information operations online as militaries attempt to influence a more fiercely contested informational battlespace. In 2010, Lt. Gen. W. Caldwell, Dennis Murphy and Anton Menning published an article in the Australia Army Journal in which they suggested that the US military could learn from the IDF's use of social media. I think they were wrong then in relation to the Gaza conflict in 2009, but they might have subsequently been proved right by events in 2012. Doug Beattie is a British soldier who has served in Afghanistan with the Royal Irish Regiment. I have long been an admirer of the bravery of his honesty. His willingness to openly contemplate, discuss, debate and publish his experience of war in Afghanistan is unusual, providing a rare insight into conflict in the 21st Century. "You turn on the TV news and there, somewhere after a report on the credit crunch and before the footie, you get the other stuff, events in brief, the stories they haven't got pictures for or don’t think are important enough to warrant two minutes all to themselves. "Amongst these fillers you hear the presenter say, 'A British soldier has been killed in action in Afghanistan after being hit by a roadside bomb'. Killed in action. KIA. It all sounds so unsentimental, so impersonal, so clinical. But it's not. It is usually brutal and bloody and painful. So here it comes, the wretched truth about KIA, a truth you’ll never hear, let alone see, on News at Ten. This is what KIA is all about." Instant and alterable web publication has helped facilitate a shift in emphasis in online news: where previously it was always displayed as a processed package, now it is also presented as a packaged process. Not a new idea of course, but hopefully never written as succinctly. OK, it probably has been put even more succinctly...but no time to check that right now so I'll just claim it and carry on. Drone Journalism in the UK? This blog started its life as a way of documenting my PhD project which is now long since finished. I thought I might know by now what this blog is becoming - if anything - but I'm afraid I'm not quite there yet. Which means the blog has kind of lost it's raison d'être ...and without that there's not a lot to be said by it or for it. There are a few potential projects in the pipeline which might give it a new direction and hopefully next time you stop by, there might be something more - I'll keep you posted. In the meantime, I've written something on drone journalism at the Frontline Club which you can read here if you haven't seen it already. The US Navy has announced that it will spend up to an estimated $249 million on “battlespace awareness”. Last Thursday, the Navy awarded a new contract to five intelligence, computer and security companies to provide both hardware and “the development, integration, and test of intelligence, battlespace awareness, and information operations applications”. In other words, the US Navy is embarking on a major new project in the area of surveillance, technology and data acquisition to provide military commanders with a detailed understanding of any conflict area. The addition of “information operations” in the contract suggests the project will go beyond the remit of geospatial intelligence and may have some capability for commanders to organise messaging campaigns in an attempt to influence various actors in an area of operations. The contract raises questions over exactly what information the US Navy is intending to collect and in which conflict areas. The investment can be understood in the context of the influence of ‘network-centric warfare‘ on US military thinking which emphasises the value of a digitally connected force as a means of improving situational awareness and military decisions. “the demands for actionable information have spiked as warfighters at every level—whether at the planning table or on patrol—are called upon to make well-informed decisions”. The battlespace awareness contract was awarded by the Space and Naval Warfare Systems Center and will initially last until August 2013. The US Navy has options in the contract to extend the work to 2017. The Space and Naval Warfare Systems Center reports directly to the Navy’s Information Dominance Systems Command. With each day of Leveson evidence new stones are overturned, shedding more light on the wider systemic and cultural problems that contributed to the phone-hacking scandal. 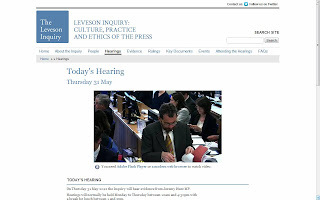 The ‘post-Leveson’ question becomes ever more pressing, as identified at yesterday’s University of Westminster conference, attended by a range of international media researchers, as well as regulation and legal specialists. But how will the national media report the outcome of the Inquiry? The media’s record in self-reporting is shaky, shown by its reluctance to give any credence to the Guardian’s initial story in 2009 revealing serious flaws in the media’s ability to self-regulate. In an article for June's issue of British Journalism Review, Judith Townend and I demonstrate how a combination of personal, professional, political and commercial dynamics led to a failure of the media’s role as an accountability mechanism in the public interest. We believe a useful new accountability tool would be an annual audit of all UK news media content. The failure of almost every other news organisation other than the Guardian to regard phone hacking as newsworthy has been well-rehearsed and we have previously shown that perceptions are backed up by the numbers. But it’s not a lone example of an issue that perhaps should have received more media attention or scrutiny. We could also look at the reporting of financial institutions prior to the crash in 2008 or the build up to the Iraq war in 2002 and 2003. As we demonstrate with phone hacking, working out why journalists regard some stories and angles as newsworthy requires significant analysis. But we don’t even have a way of systematically understanding and monitoring what news stories are being published and how they are being covered. This is beginning to seem a little strange in an era when we can collect and organise vast quantities of data from online news articles. There is no longer any reason why we could not monitor the news values of the media in a far more comprehensive manner for the benefit of the future of journalism. For the BJR essay, we were able to trace all news articles relating to phone hacking over a four year period. And academic research has benefited from resources such as the Nexis® UK database which allows searchable access to decades of news articles. But research which considers all news topics is often limited to only a few media outlets for a very short period of time and Nexis® UK is only available through subscription. In the past, it would have been exceptionally time-consuming, if not impossible to conduct an annual survey of every topic or subject that made the news. Today, nearly every news story that appears in print also appears online and news is relatively straightforward to archive. By harnessing the potential of “big data” and digital search tools, we should be able to design a sophisticated piece of software which could be used to provide the public with an annual audit of all UK media articles for an entire year. Data from news stories could be accessed to produce a breakdown of what news subjects were reported, how they were reported, by which journalists, how often and with how much prominence. This data might be analysed in conjunction with data provided by audiences from clicks on web links and the number of times articles have been shared by web users on other websites. Information that is already being collected internally by news organisations. This annual review of news could and should go beyond “newspapers” – a category of increasingly dubious relevance in a convergent media world. It could document all major online news sources whether they’re newspapers, broadcasters, new media websites or influential bloggers. Independent researchers could then analyse this data to write an accessible and publicly available online report on the nature of UK news content. A report which would provide the public with a more detailed understanding of what was regarded as newsworthy and how news topics have been reported. An annual review of this nature is not only possible, it’s also already being done outside the UK. 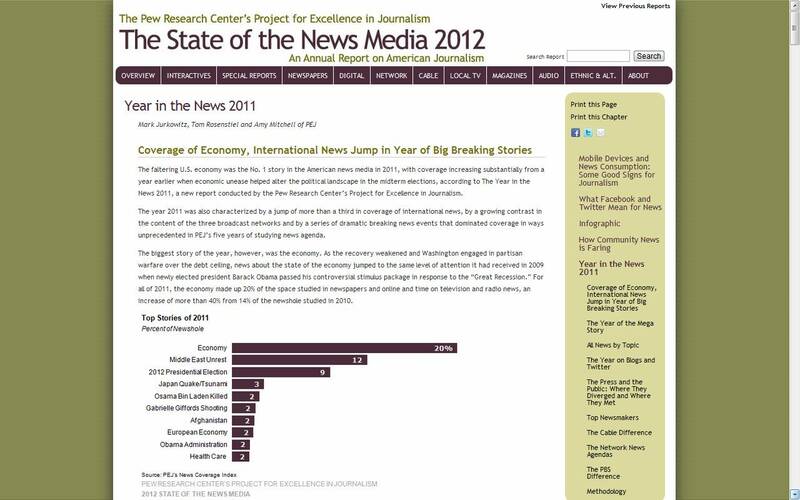 In the United States, the Pew Research Center’s “State of the News Media” report analysed 46,000 stories from 52 news outlets in 2011. One section of the report offered a comprehensive understanding of which stories and topics were regarded as newsworthy by American journalists and included data for news being shared by bloggers and Twitter users. There is also an interactive online feature on the Pew website which means the public can make their own comparisons between the coverage of news stories in different media outlets. It would be useful to combine this approach with that of the Media Cloud project, run by the Berkman Center for Internet and Society. This project includes an open source online tool highlighting which key words were used in relation to major news topics on a weekly basis by individual news organisations. 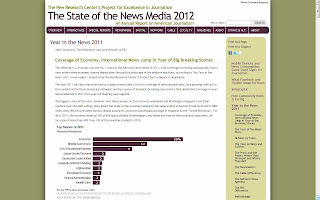 In the UK, perhaps the closest we have to anything similar is Journalisted.com, run by the Media Standards Trust. This website monitors articles written by individual journalists as well as a weekly and yearly round up of which news topics are “covered lots” or “covered little”. This represents a useful starting point, but the depth of data and analysis is limited compared with the projects in the United States. An annual audit of UK media content undertaken by an independent organisation would only be a small part of much more wide-ranging solution to the issues raised by the phone-hacking scandal. It would not illuminate journalists’ decision-making, hold them to account prior to publication or tackle newsroom culture and practices. But it is a practical step forward which would provide a comprehensive overview of what stories are making the news and trends in the way those news stories are reported. It would be an accountability tool that could benefit both news organisations and the public. For journalists and editors, it would be a useful resource helping them reflect on the shape of their coverage over the course of a year. For the wider public, it would provide a much more informed starting point for a broad debate on the how the media reports the news. We would welcome comments, criticisms and suggestions to help us take this idea forward.